Within Teamwork Projects, you can set hourly rates for people on your project. When you create an invoice based on time and expenses, the value for the time logs is then calculated based on the chosen hourly rates. 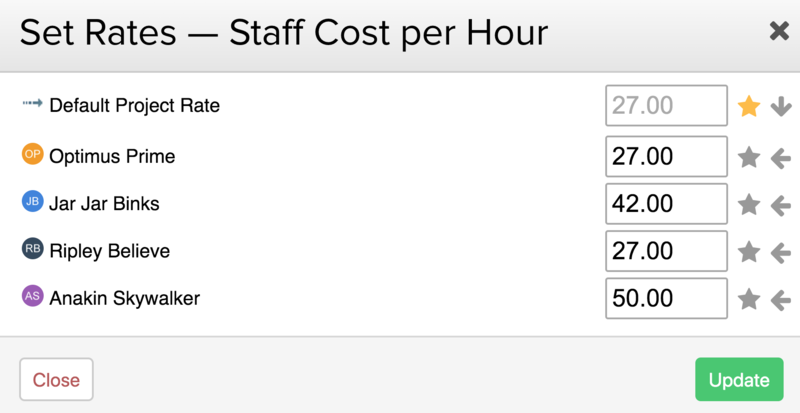 To set the rates, go to the Billing area of your project, and select the Set Rates option in the top right corner. In the Set Rates modal, you can choose a default project rate, as well as set individual rates per user. The star beside each rate allows you to set that as the project or user default across all future projects. It will not retrospectively set the rate for existing projects. The down arrow beside the project rate allows you to quickly apply that rate to all users on the project. The left arrow beside each user allows you to apply the project rate to that individual. Note: Rates are set per project, so it is not possible to have multiple rates for one person within a single project. Site administrators and project administrators are the only users who can view and set rates for other users on a project.